The Organic Fertilizer Association of California represents the interests of organic fertilizer producers, distributors and retailers that provide organic fertilizer to the agriculture and horticulture industries. 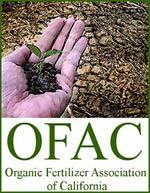 OFAC is dedicated to increasing public knowledge of biological and organic cultural systems. The association was formed in 2007 and is guided by an elected board of directors representing the California organic fertilizer industry. Dedicated to bringing its customers both high quality seed potatoes and sincere customer service. We are ready to work with you to achieve your best harvest results ever. Contact us with your questions and variety needs. We are more than happy to visit with you at any time! CSS Farms is a diversified producer of vegetable crops as well as row crops and small grains with operations across the US. "Equipment for Agriculture and Industry"
J.M. Equipment Co., Inc. was founded in 1936 by Jack Moore. Mr. Moore was one of the original partners in Moore Equipment Company that operated as the Allis Chalmers tractor dealer in San Joaquin County.